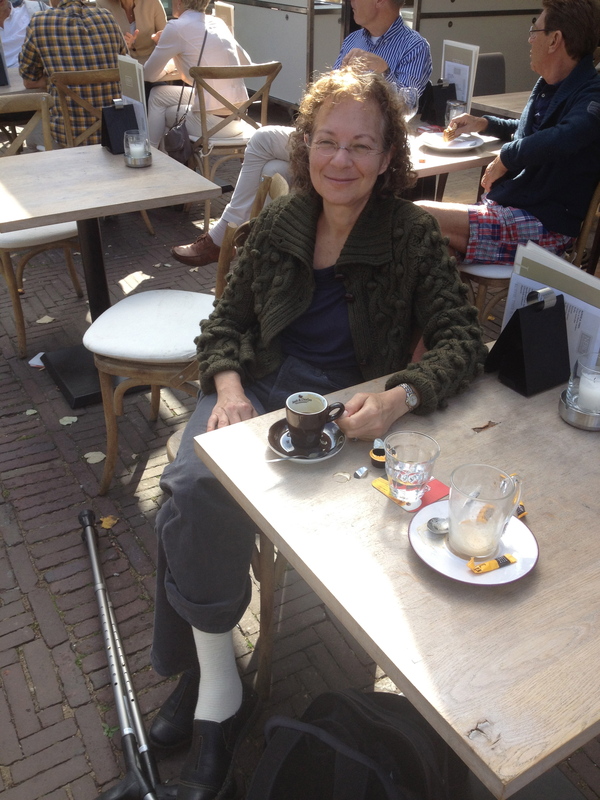 Well it started great, and ended on crutches (notice on the cobblestones), my trip to Holland. I went over two weeks ago to celebrate my sister-in-law’s 50th birthday and see friends and family, my husband being Dutch. The weather was perfect, the cappuccino perfect, but the cobblestone streets tricky, and without warning I went splat tripping over a slightly raised curb I never saw. It was one week into our 10-day trip. The husband was spending the morning in the hotel working, while I took a stroll through charming, historic Leiden. A university town with students coming back for the fall semester, it was abuzz with energy, café-sitting and good cheer. The sun was sparkling down. Approaching a store window to take a closer look, I noticed the bicycles in my way, but not that curb. Plop (that was me), twist (that was my ankle). I righted myself and sat on the curb a few minutes knowing I’d done some bad damage. That ankle has taken similar assaults these past few years, and now I had to find my way back to the hotel. And, I had no idea where I was. I limped down one street expecting to see something familiar or people at the end, yet it was deserted. Beautiful, but deserted. I followed another street with the same hopes, again deserted. Turning the corner, I found a nice young Dutchman getting ready to take off on his bicycle, and I called out, “Can you tell me where Central Station is?” Everyone in the Netherlands speaks English, thank goodness. Our hotel was across the street. He pointed to go straight, turn right and I’d be there in 10 minutes. 25 minutes later I was at the hotel. 30 minutes later I was sitting in the ER of Leiden’s University Hospital. It was 12:45 PM and learning I was given the code color blue and would be seen within two hours, even though we were the only ones in the ER, my husband played the diabetes card. Rarely done, but if it wasn’t hurting anyone else, why not? “My wife has type 1 diabetes and has to eat, we can’t wait two hours.” That got me in to be seen in five minutes – something to remember. After four people looked at me, each shaking my hand and introducing themselves, each starting in Dutch before I told them I don’t speak Dutch, an Xray was taken and we learned I hadn’t broken any bones, but now I know a bad sprain is worse. They put a bandage around my ankle, gave us a handshake and a leaflet that listed crutch stores. At the crutch store I was given my first lesson and walked out under my own steam. Only minutes later to learn how exhausting these things are. They demand far more upper body strength than I have and by the end of the first day I resolved to keep our evening plans with friends the next three days doing my best to navigate in and out of the train stations because I thought quite consciously I don’t want to die with regrets. But it was no small feat, certainly not for my feet. I’ve been home a week and I’m still on crutches. I dragged my boot cast from a former injury out of the closet. I’m crutching, hobbling and trying most of all not to move as I didn’t give my ankle the rest it probably craved when I first hurt it. A dear friend has come to be my legs, to assemble my meals, wash my dishes, drag my meter and insulin from room to room and turn my trail of lights off. I’ve seen, remarkably, that my blood sugar didn’t rise from this injury while I was still in Holland. Maybe because it took enormous effort to maneuver in and out of train stations and staircases, including the enormous marble staircase in the last bed and breakfast we stayed in. 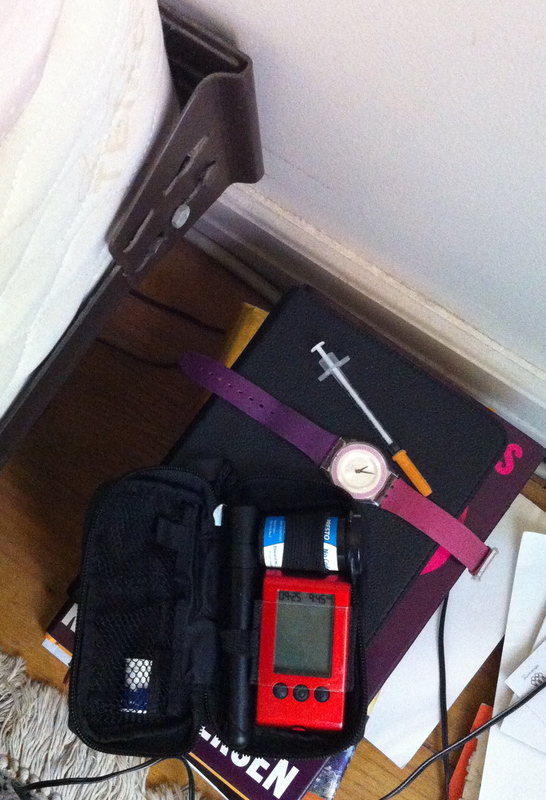 But now, trying to be still and give my ankle the rest it needs, my beautiful blood sugar numbers have gone AWOL. My rapid-acting insulin dose has doubled and I’m still trying to figure out a sufficient amount of Lantus.